The pharmacy of P. Haimalas dominates on the right side of the Central Entrance of the River West Shopping mall in Egaleo. Our design Team, succeeded once again in combining creativity with expertise, while our technicians completed a flawless construction within the limited timeframe set by our customer. The existing metallic Façade of the Mall is harmoniously combined with the original «layered perforated» frame of the Pharmacy. The lighting on the perimeter promotes and “tones” the spot, especially at night. For the interior, the custom made and specially lit shelves and furniture facilitate our customer to categorize the products. 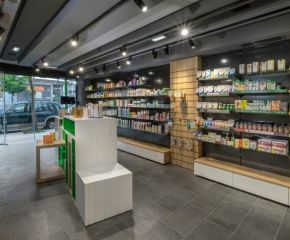 Equally impressive are the Cashiers, made of corian and glossy lacquers that serve promotional purposes and merchandising.